Menu Inventor 1.0a free download. Menu Inventor is a free and useful menu manager utility - alternative to Windows Start. Menu Inventor is a free and useful menu manager utility - alternative to Windows Start. Fast, organized, with a KDE look'n'feel and packed with features that will delight every Start-hater! Align Icons is a Windows context menu addition that allows you to align icons in any way you want. QuickRun is a handy quick-launch utility and system tray organizer for Windows 98/ME/2000/XP. With this feature packed and highly customisable Menu Bar you will be quickly adding a great menu navigation aid to documentation, intranets, web sites, help systems and much more. Deluxe Menu is a versatile, ready-made solution that allows professional and amateur web developers to create superior navigation systems for their web sites and web applications. LaunchOnFly is a free, small and easy to use alternative for the Start Menu. 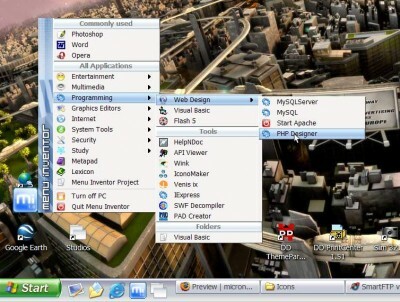 Convenient and simple Program Launcher adding two toolbars to the sides of the screen. These are sliding java menu applets available in numerous themes and suitable for sidebar navigation.